Overtime can be stressful for any team. That is unless you're SK Gaming, who in today's Epicentre grand finals manage to clutch out two wins in extra rounds to take home the big prize. After going an even 1-1 in the first two rounds, SK Gaming and Virtus.Pro were tied and vying on Train in overtime for a series advantage. Virtus surged into the B bomb site, taking out Toledo's teammates one-by-one. But Toledo just needed to make sure the plant stayed safe, and at the last-second, won the overtime round by shooting just right into the smoke. As the finals progressed to game five and into double overtime, SK Gaming once again found success with its back against the wall. 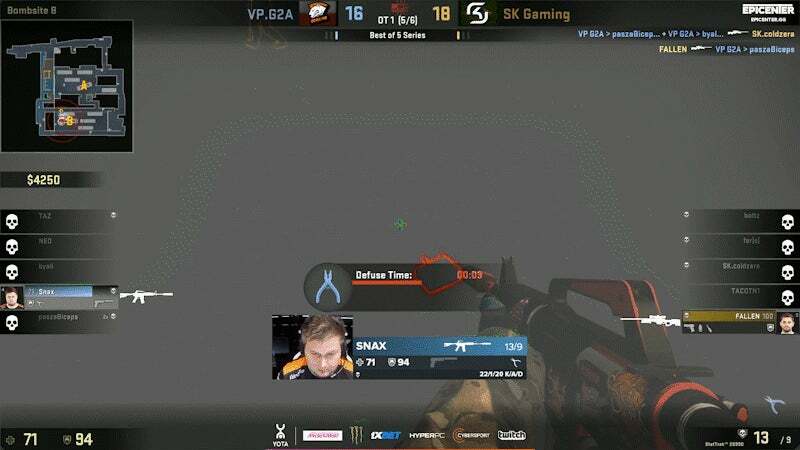 Shutting down Virtus.Pro across multiple rounds, one last hold on Cobblestone sealed the tournament win for SK Gaming. SK Gaming takes home $US250,000 ($325,525) and a premier title with the tournament win, well-earned after two clutch overtime rounds.